Is Water a Mineral? -- Is Ice a Mineral? Home » Minerals » Is Water a Mineral? The best way to find out is to compare their properties to the definition of the word "mineral." 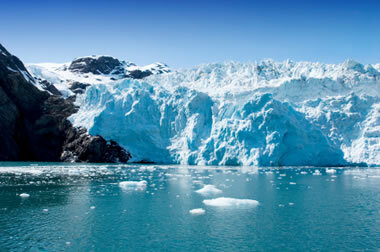 Hubbard Glacier: Photograph of the Hubbard Glacier calving into Disenchantment Bay near Seward, Alaska. Image copyright iStockphoto / MaxFX. The word "mineral" is used by geologists for a group of naturally occurring crystalline substances. Gold, pyrite, quartz, calcite, and fluorite are all examples of "minerals." If we compare the properties of water to the five requirements of the mineral definition, we find that it fails to qualify as a mineral. Water is a liquid, so it does not meet requirement #3 - being a solid. However, at temperatures below 32 degrees Fahrenheit or 0 degrees Celsius, water becomes the solid material that we call "ice." Crystal structure of ice: Photograph of a snowflake that reveals the hexagonal crystalline structure of ice. Image by NOAA. If we compare the properties of ice to the five requirements of the mineral definition, we find that it clearly meets the last four. However, requirement #1 presents a problem. 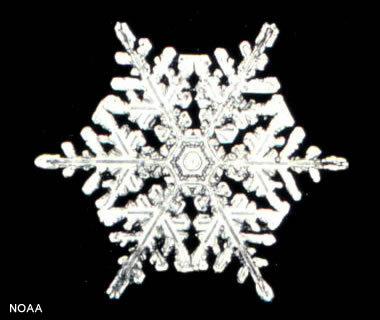 A natural snowflake would be considered to be a mineral because it forms naturally in Earth's atmosphere. However, an ice cube made in a refrigerator would not be considered a mineral because it was produced by the actions of people. So, ice is a mineral when it forms naturally, but it is not a mineral when people play a role in producing it. Water is not a mineral; however, it freezes into ice, which is a mineral. Some authors believe that water should be considered to be a "mineraloid," a material that meets some of the requirements of being a mineral but falls short. Others disagree because they believe that a mineraloid only fails to meet the requirements of being a mineral because it is amorphous, and water is not amorphous. Mineral water is something entirely different. Here the word "mineral" is used in reference to dissolved solids that occur in the water as it is taken from a natural source such as a spring. These dissolved substances occur in the water because while the water was in the ground it came into contact with mineral and non-mineral materials. Some of those materials were soluble and were dissolved by the water. To be sold as a "mineral water" a liquid must be water, taken from a natural source, and contain at least 250 parts per million total dissolved solids - that occur naturally in the water. Natural mineral waters are found at many locations worldwide and vary widely in composition. Under some circumstances the dissolved materials in the water would be considered to be "impurities." Under other circumstances these waters are bottled and sold to people who believe that the dissolved "minerals" might provide a health benefit. These health benefits are often unproven, and many natural waters contain dissolved materials that produce undesirable or even poisonous effects if consumed by people or animals.